When it comes to the science of nutrition, everyone seems to have an opinion. Consequently, there is huge disagreement, even among the experts. If we ask for advice, there are likely to be dozen different answers. So, in the era of information overflow, the general population, has become severely confused. Apart from having to choose between various food products, we are urged to make a choice between different paths, almost like finding a favorite football team or choosing a political party. Your cardiologist will likely recommend the DASH diet or a Mediterranean-type diet. Low carb and Paleo have become very popular but are often condemned by the traditional university academic. Then there is low-fat, vegan, gluten free, raw foodism and much more. In their search for better health, people spend billions every year on books, DVD’s, meal plans, diet products, and food supplements. Simple plans that promise big results are most popular, but usually, don’t work. Nonetheless, we are continuously hoaxed by marketing and empty promises. However, in the midst of all the confusion and disagreement, there is a simple measure that if taken seriously may improve our health and lessen the risk of disease more than we might never realize. And, in fact, the academics, the vegans and the low carb, low fat and Paleo enthusiasts might all agree on this one. Yes, I am talking about avoiding added sugar. The sugar in our diet is either naturally occurring or added. For example, fruit and milk contain naturally occurring sugars (fructose in fruit and lactose in milk). Added sugar is the sugar that is added to food or drink during preparation or processing. Added sugar may be natural (such as fructose) or processed (such as high-fructose corn syrup). Added sugar provides no nutritional value. However, it boosts flavor, texture, and color, and extends the shelf-life of foods like bread, breakfast cereals, tinned fruit, and vegetables. No wonder food manufacturers love sugar. Because of the lack of nutritional value, foods that are rich in sugar are often described as empty calories. If sugary foods and beverages are a large part of our diet, we are likely to miss out on essential nutrients, vitamins, and minerals. Added sugar is believed to contribute to obesity. Sugar promotes tooth decay by optimizing growth conditions for bacteria. Recent evidence from epidemiological studies suggests that high intake of sugar-sweetened beverages increases the risk for metabolic syndrome, type 2 diabetes, coronary heart disease, and stroke (1). Studies show that sugar-sweetened beverages increase accumulation of fat in the liver, muscle, and the visceral fat depot. Most of the studies support the fact that fructose is the main driver of these metabolic aberrations because it drives fat production and fat release from the liver (2). A large survey published 2014 showed a significant relationship between added sugar consumption and risk of death from cardiovascular disease (3). Individuals who reported more of their total calorie intake as added sugar had a significantly increased risk of dying from cardiovascular disease. A recently published paper addressed the link between sugar intake and risk factors for heart disease (4). The study tested the effects of consuming beverages sweetened with different doses of high fructose corn syrup on blood lipids (fats). The results showed that blood levels of LDL-cholesterol, non-HDL cholesterol, and apolipoprotein B, and triglycerides increased in a dose-dependent manner within two weeks following consumption of different doses of high-fructose corn syrup. The authors believe their findings provide a possible link to the increased risk of death from heart disease associated with increased intake of added sugar. Sugar intake may have negative effects on blood pressure. A meta-analysis of randomized controlled trials showed high intake of sugar to be associated with elevated blood pressure (5). What Are The Main Sources of Added Sugar? To avoid added sugar, we have to know where to find it. The figure below is based on data from NHANES showing the sources of added sugars in the diet of the US population 2005-2006. The figure shows that soda drinks, energy drinks, and sports drinks provide more than a third of added sugars consumed by Americans. If we add fruit drinks to this number, it becomes evident that more than 46.1 percent of added sugar consumed comes from sugar-sweetened beverages. Other important sources of added sugar are grain-based desserts, dairy desserts, candy, ready-to-eat cereals, sugars and honey, tea and yeast bread. Because sugar is such a popular food additive, we can expect to find it where we least expect it. Food we think of as healthy may contain high amounts of added sugar, such as low-fat yogurt, fruit juice and sauces (e.g. tomato ketchup and sweet and sour sauce). 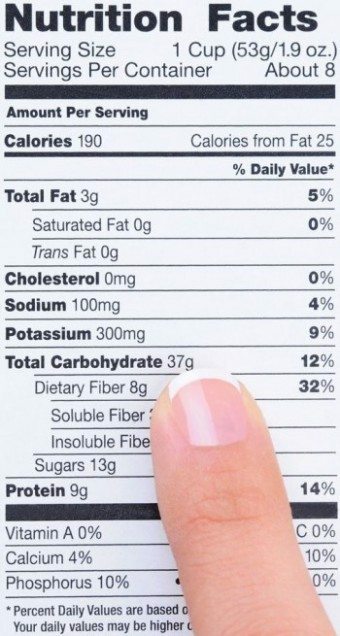 The Nutrition Facts label contains information about the amount of sugar per serving. The size of the serving (53 g in this case) has to be taken into account. Here the amount of total sugar is 24.5g per 100g (100/53 x 13g) which is very high. Finding out how much-added sugar is in our food may be confusing. The Nutrition Facts label may be misleading because it contains information about the amount of sugar per serving. So, to interpret this information, the size of the serving has to be taken into account. The only reliable way is to look at the ingredient list. However, food manufacturers are not required to separate added sugars from naturally occurring sugars. Nonetheless, if you find sugar is listed among the first few ingredients, the product is likely to contain a high amount of added sugar. A rule of thumb is that more than 15g of total sugars per 100g means that sugar content is high, and less than 5g of total sugars means that sugar content is low. Another problem is that sugar goes by many different names. The chemical name for sugar has the ending “ose” like fructose, sucrose, glucose, and maltose. So, watch out for the “ose” ending. The biggest obstacle, however, is that humans seem to love sugar and for most of us the love affair lasts a lifetime. Love is not easily conquered by practical reasoning and rational common sense. 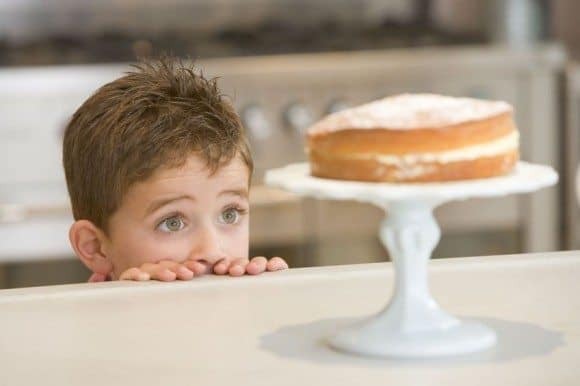 Furthermore, there is evidence that sugar consumption can induce behavior and neurochemical changes that resemble the effects of a substance of abuse. In other words, similar to drugs such as opiates, sugar may be addictive (6). A worldwide study published earlier this year suggests that sugary soft drinks kill 184,000 adults every year (7). The study shows that 133,000 deaths from diabetes, 45,000 deaths from cardiovascular disease and 6,450 deaths from cancer were caused by fizzy drinks, fruit drinks, energy drinks, and sweetened iced teas in the year 2010. Furthermore, the same study suggests that sugar-sweetened beverages significantly increase disability from diabetes, heart disease, and cancers. The authors of the paper pin-point sugar-sweetened beverages as a single, modifiable component of diet that can impact preventable death and disability in adults in high-, middle-, and low-income countries, indicating an urgent need for strong global prevention programs. Thus, taking actions to reduce the intake of added sugar is one of the biggest challenges facing public health authorities worldwide. Due to their potential commercial significance, effective measures will undoubtedly be followed by severe repercussion from parts of the food industry. But, if better health is our aim, confrontations are inevitable. However, for us, individuals and mortal human beings the message is simple; few lifestyle measures are likely to be more useful than avoiding added sugar whenever possible. Great post. I’m in total agreement with you and have written about added sugar a lot as the skeptical cardiologist (https://theskepticalcardiologist.com/sugar-as-toxin/). I’d like to re blog this on my site with my comments and appropriate credit to you if that is OK.
Of course, feel free to republish the article on your website. A point is that John Yudkin showed that feeding sugar to humans or animals made their platelets more sticky and made them more prone to thrombosis, so there is a rock-solid basis for concern re cardiovascular disease.